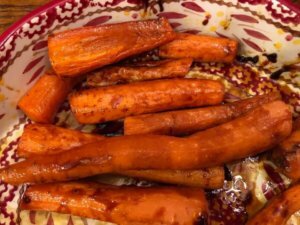 These balsamic glazed carrots will become a regular at my house. I tried them for the first time this past week, and they are a keeper. Let me tell you one thing about the recipe: when it says to simmer until syrupy and then drizzle over the carrots, then serve immediately, that’s what you want to do. 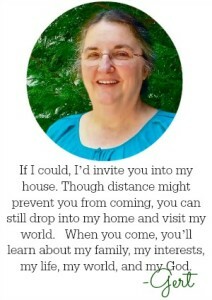 I found this recipe in Daughters of Promise magazine, and am printing it with permission. Credit for the recipe goes to Mallory Lanz. It beats the usual idea of just cooking some carrots (and adding salt and pepper) and serving them to your family because they’re good for your eyes. 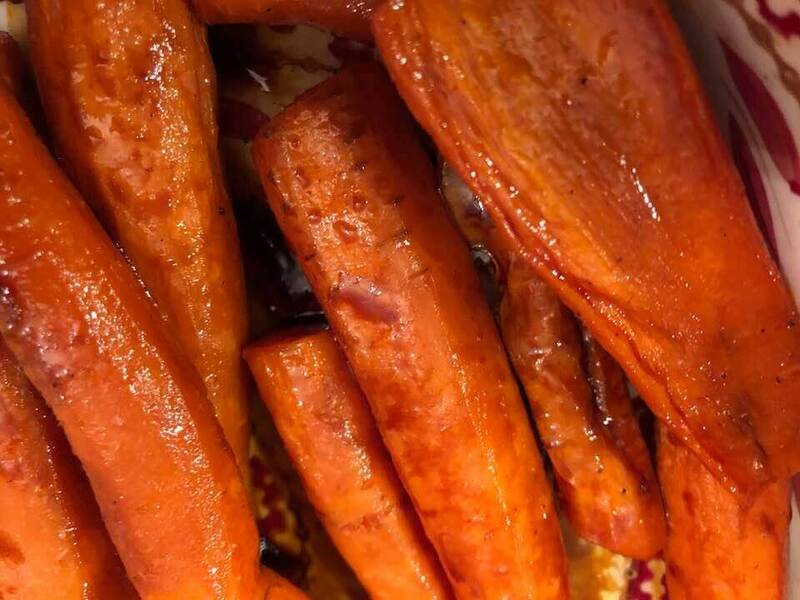 The recipe calls for baking the carrots in a 400-degree oven until tender, and roasting the carrots in the oven is the best way to go. I confess that I zapped mine in the microwave for a few minutes to soften them well, and then put them in the oven. That’s because my hubby showed up for dinner an hour earlier than what he had said he would, and I wanted to speed things up a little. 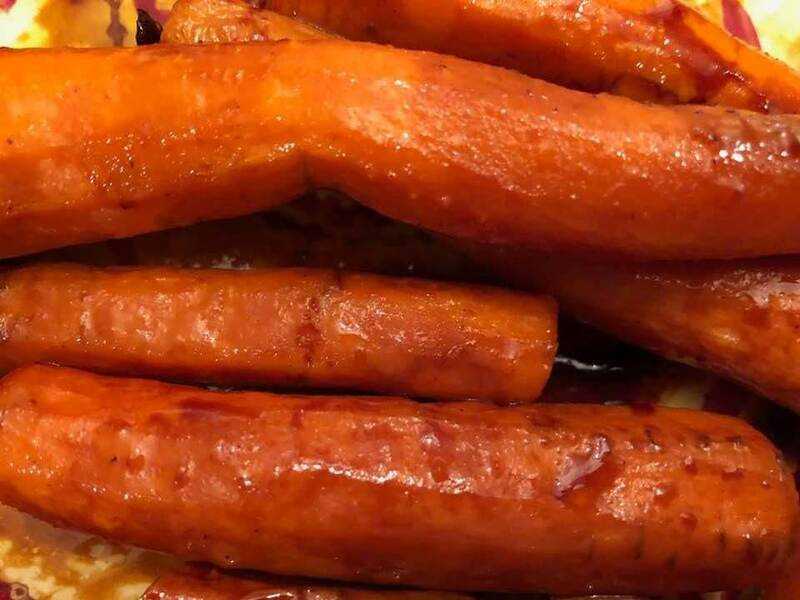 I do not recommend doing the carrots in the microwave for the entire baking time, because you will miss that roasted flavor. If your carrots are really thick, you can cut them into smaller sections to speed up the baking time. The recipe also suggests baking them on a baking sheet. I baked and served the carrots in an oven-ware stoneware dish (less dishes to wash, me thinks). To make life easier, put the carrots on the tray or pan you will be baking them in, then sprinkle olive oil and your seasonings on top; stir until the carrots are coated, and you are ready to roll. 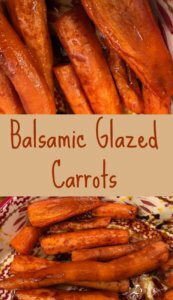 Balsamic Glazed Carrots are so easy to do. This glaze makes them savory and delightful to eat. Enjoy!